Hanne Van Ooij rides on high in the “Chroma Wheel” by Jason Kim for Models.com. A mesmerizing mix of art and color. Like a preening peacock showing off it’s wings, her eyes rise to meet the light. Hanne’s face gives off great expressions, emoting like a creature of flight. Morgane Martini creates a wingspan that covers the lids and beyond, capturing the illusion of flight. Graphic shapes seize the orbital field, highlighting the body of the bird. 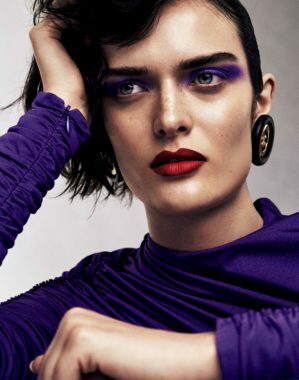 Julia Banas brings forward a new brand of beauty in “Glowing in the purple rain” by Ben Hassett for Vogue Italia Beauty, 05/17. This may appear upon first glance like we’ve stumbled over a cash of new colors. That alone would be an exciting find. However, what we have are distinct tones used in new and exciting ways. That’s to say, while these aren’t exactly colors from another galaxy, they do appear like art unleashed from a different world. 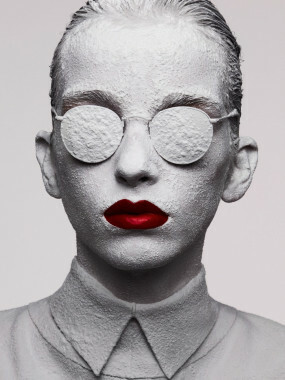 Mia Brammer enters an arena of neo-application in “Cut It Out” by Riccardo Dubitante for Models.com. Teal streams fall like tears from the sky opening our minds to the thoughts on high. Like rivers running down her face, this flow brings forth the fluid nature of forward beauty. 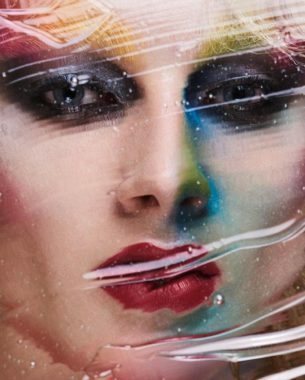 Serena Congiu uses a variety of shapes as a conceptual landscape for this multi-layer makeup experiment. Modeled poetry mimics the momentum of integrity expressed in live sculpture. 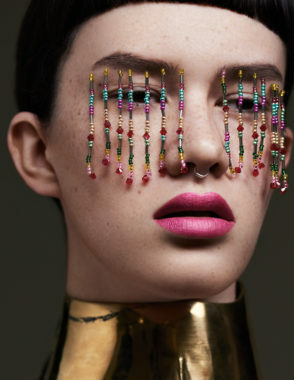 Jazzelle Zanaughtti projects forth a picture of future, in “Gilded Glory” by Andrew Yee for Models.com. The intensity of her state isn’t merely the makeup of her face, rather, the excess emanating from her being is that of a higher plane. Looking into the pools of her eyes we’re lost in the immaculate creative conception. Like a creature from another planet her exotic nature penetrates the page. Chanel Cosmetics captures a killer theme with “Kiss Me Deadly” by Donna Trope for 10 Magazine No.58, SS 2017. Karmen Pedaru brings forth a fusion of bombastic beauty, showing us that extreme doesn’t mean heavy application. Skin to skin this story lets us in to a world where the inventive nature grows free. She’s soft in all the right places with personality that evokes an edge. 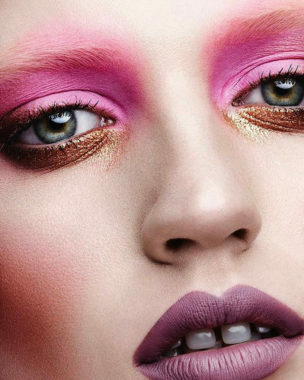 Isobella Bowering lights up the night in “We’ll Take Chrome” by Armin Morbach for Tush Magazine #39. The face is not merely a place where we drop makeup off, rather, it’s a chance to reshape our ideas on beauty. A spectacle of sensation appears on sight, as features dance under the bright lights. Art evolves before our eyes as this story gives us a sense of adventure. Editor-n-Chief of Vogue Paris, Frédérique Verley, stepped in as style supervisor, showcasing a variety of visual stimulating designs. Sam Rollinson & Hoyeon Jung say goodbye to the past as they welcome in 2017, in “Time to Party” by Marcus Ohlsson for Vogue Japan, February 2017. Confetti hits the floor as the clock strikes 12:00 AM. Celebrating the party theme… glitter dances beauty abounds, as colors collide in a circular surround. Symphonic shades are ready to go as Fredrik Stambro steals the show. 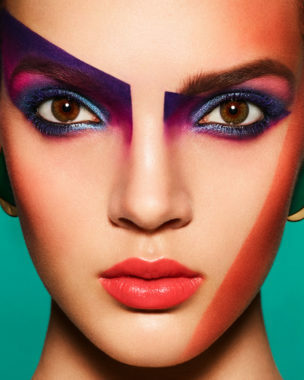 Eye-to-eye & Face-to-face ~ vibrant creations can’t be erased. Lindsey Wixson mimics floral beauty as she basks in a “Bouquet of Flowers” by Richard Burbridge for Vogue Russia, September ’17. Auspicious yearnings of tomorrow are found in the cradled optimism of today. Curves catapult us into another dimension with lips that switch from pink to orange. Burbridge brings a flap that functions as a see-thru accessory, lined with silver. While the brim goes beyond the trim, with white netting pulled down over the eyes. Vincent Beier feels the fire in “Fantabulous” by Armin Morbach for Tush Magazine. Beautiful bones are built in such a way that makes us all but gasp, for here inside this wall-less world is where all hope is masked. Hidden around the corners ~ bent beneath the walls ~ are eyes inside that watch to see the beauty that befalls. For here we meet together, upon this lonesome road, to find a kind of strength that will carry this heavy load. Jena Goldsack brings the big-top to town in “Funny Face” by Liz Collins for Mixte Magazine No.17, November 2016. Step right up and you will see a show you’ve never known, from here to fore and way beyond is a tale that’s told in a storied song. A kiss will hit upon the lips as love will spin you around, beset by beauty art doth adore vigor is found in love’s long-lost lore. Cierra Skye comes from a place up on high into a world where hope but does fly in ‘Tema e Variazioni‘ by Marcus Ohlsson for Models.com. Like pieces of live installation, these works aren’t seen as human specimens rather that are viewed as carriers of creativity. Up close and personal, Skye comes through the celluloid wall with such visceral display, we are left to merely keep up. 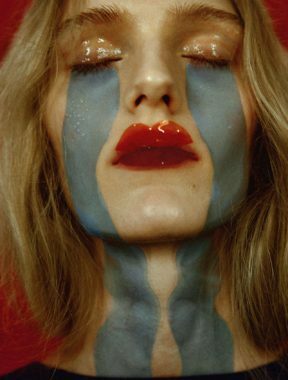 Jamilla Hoogenboom & Aneta Pajak explore the impact of intensity in “Le Choc Des Pigments” shot by Ben Hassett for Vogue Paris, 11/16. Not merely a function of attraction or a progress of pretty, color is a visual construct. The power of pigments is an intense concept, when applied, it inspires you to react. Like a statue that’s erected on site, a milky, white layer falls over every inch of her skin, hair and body.